Games and interactive virtual worlds increasingly rely on interactions with the environment, and require animations for displaying them. Manually synthesizing such animations is a daunting task due to the difficulty of handling the close interactions between a character’s body and the object. Capturing such movements using optical motion capture systems, which are the most prevalent devices for motion capturing, is also not very straightforward due to occlusions happening between the body markers and the object or body itself. 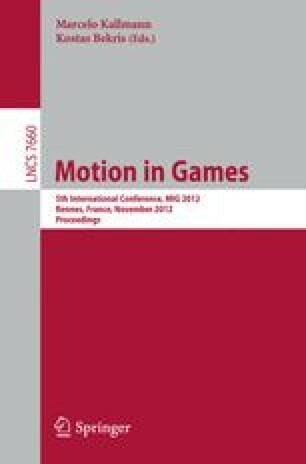 In this paper, we describe a scheme to capture such movements using a magnetic motion capture system. The advantage of using a magnetic motion capture system is that it can obtain the global data without any concern for the occlusion problem. This allows us to digitally recreate captured close interactions without significant artist work in creating the scene after capture. We show examples of capturing movements including opening a bottle, drawing on a paper, taking on / off pen caps, carrying objects and interacting with furniture. The captured data is currently published as a publicly available database.